Preheat oven to 200°C (400°F). To make the roasted fennel, place the fennel, maple syrup, oil, salt and pepper in a large bowl and toss to combine. Spread the mixture on 2 large oven trays and cook for 20–25 minutes or until golden and caramelised. Set aside to cool slightly. While the fennel is cooking, heat the oil in a medium saucepan over medium heat. Add the onion and garlic and cook, stirring, for 5 minutes or until softened. Add the split peas, stock, water, tarragon, salt and pepper and stir to combine. Cover with a lid and cook for 10 minutes. Reduce heat to low and cook for 30 minutes or until the split peas are tender. 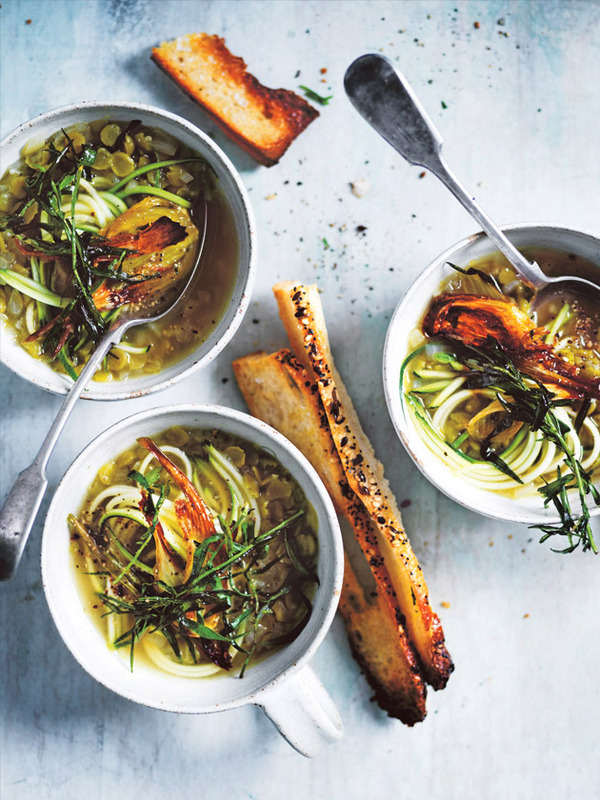 Divide the soup between bowls and top with the zucchini, roasted fennel and extra tarragon. Serve with the bread. Serves 4.